What made you decide to become an Osteopath? As a child I was always very curious about how things worked, especially people! I grew up with an International badminton player for a mother, and my Father was the England, Surrey, New Zealand (etc) badminton coach for over 50 years! I helped coaching them with footwork from the age of just 4! I was used to watching teenagers moving around a court easily, but the veterans didn’t! They often had better rallies but their limbs didn’t work or look quite the same!! Why did their elbows no longer straighten? Why couldn’t they reach the sides of the court so easily? etc. Why did some people’s knee or shoulders dislocate easily, and others didn’t? Osteopathy was my route to answering the WHY. I could never understand how taking painkillers to mask things was ever going to make a lasting difference (as with “Orthodox” medicine). I wanted to get to the CAUSE of the problem and then work from there. I LOVE my profession and the system of healthcare that it embodies, safely and with sometimes spectacular results. I am passionate about helping you to better health and vitality. Place your healing in my hands. What can I expect on my first visit to my Osteopath? At the first consultation, the Osteopath will compile a full case history of your symptoms, as well as asking for information about your lifestyle and diet. The Osteopath may also observe you making some simple movements to help them make a diagnosis. You will usually be asked to remove some clothing near the area of the body to be examined. Osteopaths are trained to examine areas of the body using a highly-developed sense of touch, known as palpation, to determine conditions and identify the body’s points of weakness or excessive strain. Osteopathy is a ‘package’ of care that includes skilled mobilising and manipulative techniques, reinforced by guidance on diet and exercise. The Osteopath will discuss with you the most appropriate treatment plan, estimating the likely number of sessions needed to treat your condition effectively. If the osteopath thinks that your condition is unlikely to respond to osteopathic treatment, you will be advised about how to seek further care. Osteopaths are skilled in diagnostic techniques and trained to identify when a patient needs to be referred to a GP. I have found over decades of experience that if I treat for more than this my clients get “over-treated” and their bodies fatigue. It isn’t dangerous but it tends to give poorer treatment reactions which are best to avoid. It can leave you a bit more sore than might be necessary. Occasionally I will give a double appointment slot if there are two quite discrete problem areas eg a foot/ankle and neck/headaches. Always ask what is best for YOU. Your Health IS My Priority. Depending upon the problem and its severity it may be uncomfortable at times. In the same way as pushing a bruise is sore, so working on tight or damaged muscle / tissue can be unpleasant for short periods of time. This is not a bad thing, and some discomfort can be quite a “good” pain – such as when massaging into the upper shoulders / lower neck area. 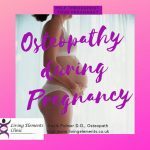 If it is very uncomfortable please tell the Osteopath immediately – although they may well have picked that up with their highly sensitive hands already. Everyone has different pain tolerance levels and perceptions. No more force / pressure is used than is necessary. Following a treatment, as the body settles down into a new way of functioning and structural changes take place you may be sore for a few hours or couple of days only. This is often quite a different sensation to the pain which you presented with and indicates that your body is adapting and changing to a new pattern. This is a good thing. To help this period reduce in duration – drinking plenty of water and taking gentle exercise helps things return to normal. Absolutely! 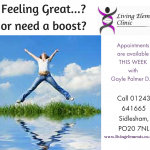 Gayle specialises treating both before, during pregnancy and post partum! Just let her know if you are or if you suspect that you are pregnant! Did you know that Gayle has also attended two deliveries too?! This was to support both the parents AND the baby. Start young – the results are remarkable! Is there disabled / wheelchair access? 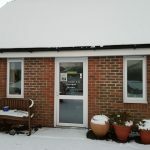 The clinic has a large tarmac carpark and entrance to the clinic and treatment room / toilet are all fully wheelchair accessible. By all means park near the clinic entrance if you have limited mobility for your convenience. You are welcome to come with a friend or relative. The only proviso is that the treatment room is fairly small, and some techniques need quite a bit of room to undertake, so please do not be alarmed if the friend is requested to leave, or if a conversation / an aspect of the examination / treatment may be better said in complete confidence. Further, if you want a chaperone to be present please give advance notice as usually Gayle works on her own. Thank you. Will I need to remove my clothes? As with any medical examination, you will probably be asked to undress to your underwear, so please wear something you are comfortable in. Wear whatever makes you as relaxed as possible – this may be shorts or a vest in addition to your underwear. Jeans/ stiff shorts are not appropriate as they restrict movement / treatment and the ability to feel the tissues under the fingers. Fresh underwear is appreciated! Gayle understands that it can be embarrassing to stand in front of someone in a state of partial undress but it is important to do a thorough examination if the case history indicates that it is necessary. You will be able to lie on the couch covered with a blanket to preserve your modesty once treatment starts. Yes – I call them “MOT’s” – or having a service! Fine tuning the body helps it to work better and more efficiently. It also helps to prevent problems. I recommend that you have a regular “MOT” every 6 months, and at least annually. Just like cars do! The treatment duration is still 30 minutes. If I haven’t seen you for a year or more, there will be a brief checkup on your medical history in case things have changed. Osteopaths’ patients include the young, older people, manual workers, office professionals, pregnant women, babies, children and sports people. Basically from -0y to +100 years! Age, profession, hobby are not reasons to avoid seeing your friendly local Osteopath. Osteopathy focuses on the diagnosis, management, treatment and prevention of musculo-skeletal and other related disorders without the use of drugs or surgery. The most important thing to realise is the Osteopaths do NOT treat conditions but INDIVIDUALS! – YOU! Each treatment is tailor-made and unique for you at each appointment. What's the difference between an Osteopath, a Chiropractor and a Physiotherapist? Great question! The answer that in some ways things are becoming more similar too. If you like, we are all related cousins… we often treat similar things but with different biases and techniques. Each practitioner is also different. Chiropractors tend to do more spinal manipulation (the “click”) which they call adjustments than the Osteos or Physios. They do far less soft tisse work and their treatments can be markedly shorter in duration. They often see clients a few times a week for months! Physiotherapists are often hospital based. They rarely manipulate (“click”) and some even do little manual treatment at all. They tend to give more stretching exercises and give exercise prescriptions generally. They often work under the auspices of your GP. You can get, once passed the waiting list, a course of 6 physio sessions on the NHS via your GP. Osteopaths are “Primary Health Practitioners” – we see clients who have self referred ie NOT via their GP. So we are trained to diagnose serious complaints which may need urgent referral to a GP as well as other problems. Osteoapthy is a whole system of diagnosis, treatment and health care advice on a wide variety of subjects from nutrition, posture, activities and sports rehab etc. We treat using a wide range of modalities (techniques) depending on each individual clients needs. EACH treatment is unique, tailor-made and unrepeatable! We work towards the Health of the patient, not about solving the “diagnosis”. We treat ALL the tissues in the body eg skin, bones and joints, muscles, the soft innards, nerves and blood supplies etc. Our mode of delivery is usually only via our highly sensitized and trained hands with a fabulous knowledge of the body and its workings. The medical profession considers that one moderate to major adverse event in 10,000 treatments is safe. Recent research has found one moderate to major adverse event in 1:36,000 osteopathic treatments. When considering the type of treatment suitable for each patient the medical history is taken into consideration. For instance gentler treatments would be used if osteoporosis has been diagnosed or if it is likely to be present. Osteopathic manipulation of the neck (the technique that produces the clicking noise) carries a very small risk of stroke but this is believed to be equivalent to the risk associated with having hair washed in a backwasher. If a patient is elderly or has a history of stroke then this technique would not be used for instance. If you would prefer not to have a certain type of treatment, please let your Osteopath know. Gayle did her 4-year degree course at The British School of Osteopathy between 1987 and 1991. During this time she completed an extra 2,000 clinical hours over and above the mandatory 1,800! She worked in extra clinics, especially the Expectant Mother’s Clinc, Children’s Clinic, Maxillo-Facial Clinic and Sports’ Injury Clinic. Gaining lost of extra and unusual experiences. She was also able to work alongside a number of notable revered colleagues who had shaped the profession over many years themselves. On qualifying she worked in Cheam, Surrey for 18 months for an Osteopath 30 years her senior and built up a busy list with a waiting list. Unheard of in his experience of Associates! Whilst working in Cheam she started her own surgery in Birdham, Chichester and increased her options with working in Chichester once on her own. For three years on her day off Gayle used to treat voluntarily at the Osteopathic Centre for Children, now the Institute of Paediatric Osteopathy in London. A fabulous learning experience. Throughout her first 15 years of practice Gayle has completed at least a week’s residential post-graduate course, usually in aspects of Cranial Osteopathy. Since then she has done courses as they really interested her or added to her knowledge base including on consent and practice management. She went on to study Biodynamic Osteopathy with Dr. James Jealous D.O., a visionary healer and Osteopath from the USA. This has had a huge infleunce on how she now works. It is truly brilliant in its depth and effectiveness. In addition she has created and joined various post-graduate groups both locally and nationally. Notably The Sutherland Society – to expound the ideas of cranial Osteopath William Garner Sutherland. She used to be a member of the Cranio Group too – for like-minded dentists and osteos/chiros etc. They look at facial and dental development and its relation to the rest of the body in particular. Essential knowledge for child development and understanding. As part of our continuing professional development Gayle has to do at least 30 hours per annum, she often does many, many more! That’s the thing about answering the “Why does X do this..?” – you never stop learning! Most patients ‘self refer’ to an Osteopath for treatment. Although referral by a GP is not necessary, patients are encouraged to keep both their GP and osteopath fully informed, so that their medical records are current and complete and the patient receives the best possible care from both healthcare practitioners. Often your GP may not realise the full depth and breadth of Osteopathy and its benefits as Osteopaths work outside the NHS system usually – they are often curious and surprised by your tale. DO tell them about your experience. Not all Osteopaths work the same either – so our special interests may be unique. The Osteopathic Centre for Children in London, where Gayle Palmer worked for three years. A superb resource for Londoners for paediatric and obstetric / gynae Osteopathic Treatment. 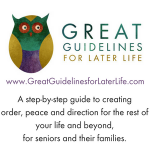 Courses created by Gayle Palmer to help seniors and their families come to terms with the passing years and how to practically get their lives organised so that they can create a future free from unnecessary concerns. Procrastination is the disease of ill-health – don’t let it get you! These courses and resources can make the difference. Breakthrough science and programs put together to empower, support and create freedom for all concerned. There is a free starter kit which you can download that has already saved two lives! Ideal for ALL ages, needs and situations. A local Chichester-based charity that is nationwide. Holds regular meetings, talks as well as being a resource base for cancer patients and their families. Looking for an Osteopath when you are on holiday and the Living Elements Clinic isn’t open?